Using fine quality raw material and up to date techniques in our state-of -the art manufacturing facility, we offer Spun Poles. HBL Power Systems Limited offers state-of-the-art technology Precast Pre-stressed Spun Concrete Poles for Power Transmission. We produce spun concrete transmission poles that offer best utility and value for money. Our company is able to to manufacturing and supplying Spun Poles. 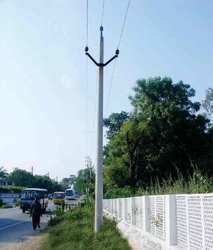 Owing to our immense market knowledge, we are able to offer excellent quality Concrete Spun Pole. We are one of the best manufacturer of Spun Poles. B.K. Cement Pipe Manufacturing Co.
We are successfully meeting the varied requirements of our clients by providing the best quality range of Spun Concrete Poles. We have been able to offer our clients a qualitative range of Spun Poles. At Sri Dattasai Cement Concrete Product we provide Spun Poles to our customers. Spun Concrete Poles is an excellent option for WIND Energy projects due to its circular form and absence of edges/angles, the magnitude of wind forces acting on it is less than on rectangular pole for the same projected area and wind forces are diffused because of circular structure. Our company is one of the major company who deal in Spun Poles. We have founded ourselves as a recognized manufacturer of Spun Poles. Prince Concretes Mfg Pvt Ltd.